I’m rethinking keeping the planner. It might be more useful to let the human female have it. We still haven’t reached the end of the SWAG. Inside the ugly green bag is a soft canvas tote bag emblazoned with a friendly sheep. Sigyn is smitten. Oooo! The sheep on the bag is holding a tote bag with a sheep holding a tote bag, with a teenier sheep holding an even teenier tote bag! Et cetera, ad infinitum. How very recursive. There’s something else soft and cloth-y down there, too. I think it… Yes, it’s a T-shirt. Size Enormous, just right for the human female. Sigyn is trying to imitate the Science Ninjas on the front. Hold on–There’s something rustling around right down at the very bottom! Something alive! Fandral’s mustache! Who’d have guessed? A stout, soft, squeezable swine, a veritable pudgy prince among porcine playmates. Sigyn has named him Percy, and–ugh! Sigyn! Don’t kiss the piggy! That’s it. I think we’re done with SWAG here. Let’s stuff all the junky literature back into the hideous tote and carry off our booty. One never really knows what the vendors are going to be handing out as SWAG. This pen has a little light! We can use it for reading in bed and harassing the feline! And this ruler could be very useful too. Hold your cute little foot up, and let’s see what size shoe you take. Some SWAG items are more fun than others. Unhand my beloved, you pernicious pincher! Hang on, dearest, Loki’s coming! Here, Sigyn, these won’t hurt you. Sigyn, of course, has a favorite. I heard the human female say the colored pencils were a door prize. Presumably that means the show coordinators thrust them at her as they shoved her out the door. Probably worth giving away good stuff just to see her leave. The human female is hoping that there will be office supplies amongst the SWAG. Notepads are always welcome. Oh, look! Here’s a very nice planner! Even though nearly a whole month is gone, I can still put this to good use. A world-conquering supervillain can never be too organized. This notepad just needs a little personalizing. From time to time the human female goes to one of the Scientific Products shows that are held on campus. Theoretically, it’s so she can go and look at products that might be useful in the teaching labs or talk to the vendors and try to arrange a good price for chemicals or labware that she needs. But I know better: These shows usually have free food, which she is genetically incapable of passing up. Also, the vendor booths hand out little free things. Collectively, this is called “SWAG” The human female will stand and talk with purveyors of multi-thousand-dollar microscopes and animal-anaesthesia systems and whatnot, knowing full well she will never buy anything from them, just hoping they are handing out superior trinkets. I think therefore, that “SWAG” might also be an acronym: Stuff We Aren’t Getting, or perhaps Schmooze While Actually Greedy. Today the human female has returned with quite a haul, all loaded into this handy-but-garish insulated bag. She has left it unattended whilst eating her lunch (Really? She has room for lunch after inhaling a buffet’s worth of cookies, fruit, pizza, and bagels?) Sigyn, let us examine the contents more closely. There seems to be a vast quantity of paper inside. Hmm. A coupon for a company which deals in gold. She is just going to squander this, so I think I’ll take it. I could use some more gold. Sigyn is going to be disappointed when she learns that this company does not actually sell orchids. Do you recall the round baked things the human female made a while back? She stuffed one of them with bacon and cheese (which was delectable), and the other was full of brown sugar, cinnamon, and orange peel. She froze that one, hoping I’d forget about it, so she could eat it all herself. The other day she trotted it out, let it thaw, warmed it up, and drizzled drenched it almond glaze. It looked positively scrumptious. Then she put on some slivered almonds and it looked even better. They don’t make ME happy, so she has no business putting them on anything destined to come anywhere near me. Bleargh-shudder-bleargh! Too sweet! Too sweet!! Cherries are for eating out of hand or for pie, woman, not for dousing in syrup and red dye. 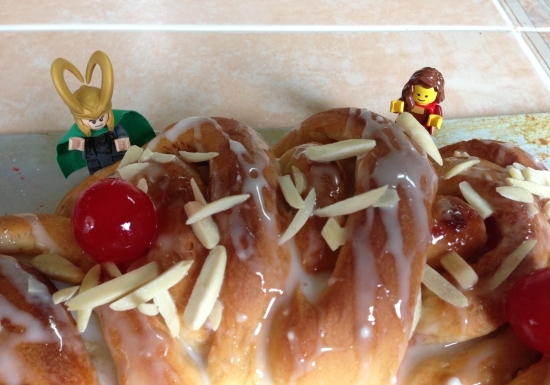 On Asgard–Hel, even on Jotunheim!–we do not torture stone fruit in such a barbaric manner. How did you people ever learn to walk upright and stop eating mud? The mending pile is huge. (I may have helped pop a few seams and wrench off a few buttons…) The give-away pile is even bigger! I could donate tha— Wait. What am I thinking?! Loki, God of Greedy Mischief, does not give anything away! Nope. I’m keeping this old cloak for all the sweaty, muddy, prickly rambles the human female drags me on. The poor will just have to find their own green cloaks.